Backups is one of the most important parts of having a working website. It is crucial to backup your files on a regular basis or just before making any substantial changes so that a backup is available in the event of data loss or server breakdown. Even if your hosting provider is doing backups for your account, we recommend performing your own backups for increased redundancy. On most hosting platforms, there are implemented features that will help generate and download a full or partial backup of files or databases. 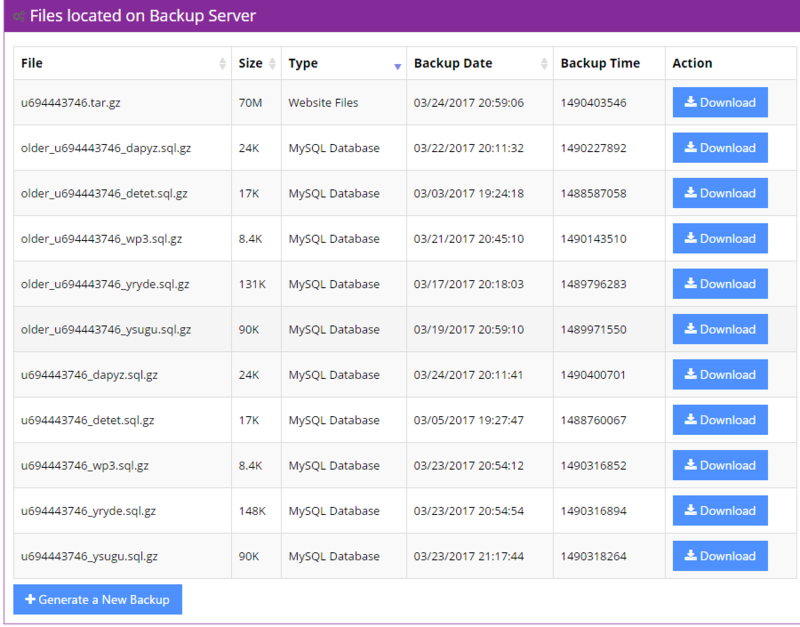 On Hostinger, you may find ready backups available for download in your control panel’s Backups section under the Files category. It will include both the files and databases of an account. After entering, you will see a list of files each with a unique description. The Type section specifies whether the file consists of a MySQL Database or Website Files. You may also know the backup generation date by checking the Backup Date section. Once ready, press the Download button near your desired file to begin downloading it to your computer. It is also possible to Generate a New Backup in case you want the latest copy of your files. Keep in mind that it will override your old backup. To proceed, you will be prompted with a confirmation screen. Automatic Full Account Backup. 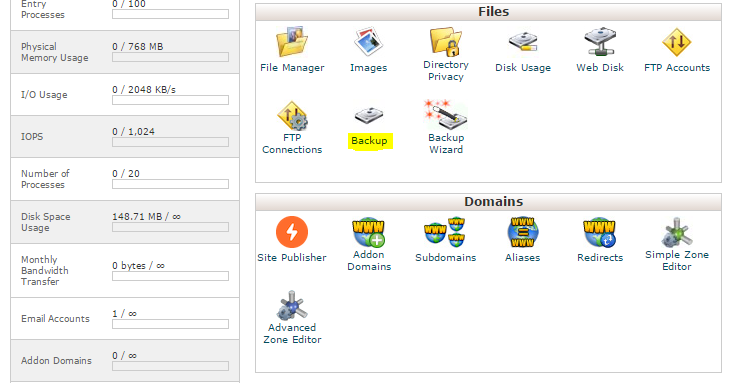 This type of backup is usually offered with cPanel system and it lets you create a full account backup, including website home directory, MySQL databases, emails and DNS settings. Full cPanel backup is mainly used if you want to transfer your account fully to another hosting provider who is also using cPanel. Automatic Home Directory Backup. 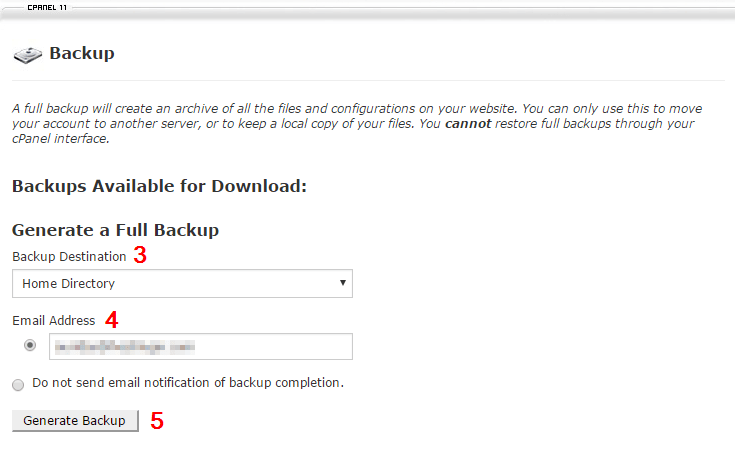 You should choose this option if you want to have a smaller backup that consists of your website files and emails only. It is the simplest way to download a backup of your website files. Manual Website Backup. With this option, you only save the relevant website files and nothing else. The resulting backup takes the least space compared with the other two options at the expense of being more complicated. In this tutorial, we will show you how to use each option to download a backup to your computer. 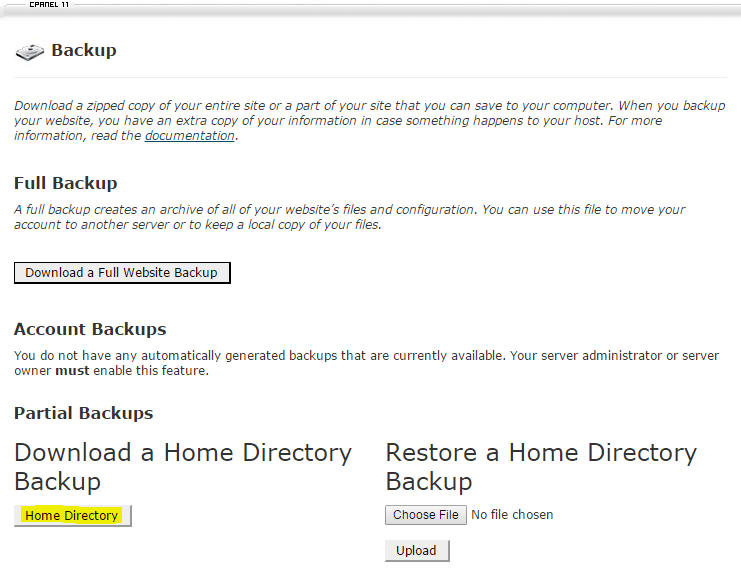 On the next page, from the Backup Destination drop-down menu select the Home Directory option. For Email Address, select whether or not you wish to receive an email notification once the backup is complete. You may also change the notification email address in the provided field if you wish. Click Generate Backup. You will see an info message stating that the backup is in progress. Click Go Back. Depending on your account size, it may take a while for the backup to be generated. Under Backups Available for Download, you will see your backup file name with a .tar.gz extension followed by the backup creation timestamp and an [in progress] message while the backup is being generated. Simply refresh the page after a few minutes to check if the [in progress] message is gone. When the message has disappeared, click on the backup file name and download it to your computer. In the Files section, click the Backup icon. While this option allows you to download exactly what you want, you do need to know where exactly your Website is stored on the account. In the main window, select the root folder of your Website with a single mouse click. A root folder is the place where all your Website files are located. It is most likely public_html if your website is not installed in any subdomain, subfolder or an addon domain. Otherwise, you may have to dig deeper into public_html and search for your Website’s root folder. Click Compress in the top menu. Choose any Compression Type (for compatibility purposes we recommend either Zip or Tar), enter the name for your resulting backup file (or leave the generated one) and click Compress File(s). You will see a popup indicating the status of the backup, followed by a Compression Results screen, feel free to Close it. Locate the generated backup file in the main window and select it with a single mouse click. Click Download in the top menu to start the download process. Automatic Full Account Backup, giving you a complete account backup while also resulting in the biggest file size. Manual Website Backup, allowing you to create a backup for a specific folder. Automatic Home Directory Backup that is very easy to perform and does not take as much space as the full backup method. Thanks for sharing this useful information. Second manual backup tutorial is good.